On October 17, 1926 the Los Angeles Buccaneers came to Canton to take on the Bulldogs in an early-season NFL contest. The Buccaneers were a traveling team, thus playing all road games while being ostensibly a Los Angeles franchise. 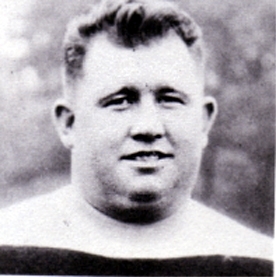 End Brick Muller, formerly a major college star at the University of California, was the most well-known player on the club that was sometimes referred to as “Brick Muller’s Californians”. 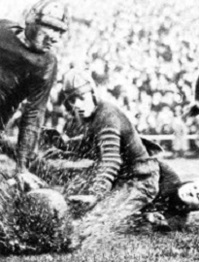 He was also a player/coach along with his former college teammate, tailback Tut Imlay (pictured above), and the roster drew heavily from California schools. The Buccaneers came into the game at Canton with a 1-1 record. The Bulldogs were a once-formidable franchise that had fallen on lean times. After being dormant for a year, Canton back to the NFL in 1925 and went 4-4. They were 1-1-1 thus far in ’26 and still contained big names such as tackle Pete “Fats” Henry, who was also a co-coach along with back Harry Robb, and the aging legend, Jim Thorpe. There were 5000 fans in attendance at Lakeside Park in Canton. The first quarter was scoreless, but in the second quarter a mixup in the LA backfield caused a loose ball that was picked up by end Cliff Marker of the Bulldogs, who ran 30 yards for a touchdown. Pete Henry (pictured below) added the extra point. Late in the period, the Buccaneers scored on a pass from FB Tuffy Maul to Tut Imlay for a 30-yard TD. However, Maul’s extra point attempt was unsuccessful and Canton held onto a 7-6 lead at the half. Early in the third quarter, the visitors were forced to punt from their own end zone, which gave the Bulldogs possession at the LA 33. A good drive led to a one-yard touchdown carry by Harry Robb. Henry’s PAT attempt was nullified by a penalty, but Canton’s margin was now 13-6. Later in the period, the Buccaneers drove to a one-yard TD by Maul, who added the point after to tie the score at 13-13. LA reached deep into Canton territory in the fourth quarter and Maul kicked a 17-yard field goal to put the Buccaneers in front by three points. The Bulldogs went to the air in desperation, but couldn’t come close to scoring again. The closest opportunity was a Henry drop-kick from midfield that was blocked. The Buccaneers hung on to win by a final score of 16-13. The point total for the Buccaneers proved to be their second-highest of the season, although they compiled a healthy 6-3-1 record that placed sixth in the non-divisional 22-team NFL. The 1926 season proved to be the only one for the franchise, although they did play preseason contests in ’27 (and actually played them in California). Canton struggled through a poor 1-9-3 campaign that ranked 20th in the league. It also proved to be the final year for the once-proud club.